A big thank you to Lorrie Squibb for her courage in speaking up! You can read more about her in the Denton Record Chronicle, Breast cancer rate climbs up. Lorrie’s cancer is not included in the Department of State Health Services Flower Mound cancer cluster study because–despite the FACT that she contracted her cancer while living in Flower Mound–cancer statistics are kept in the location where the diagnosis occurred. A 1/2 radius around the Bunn Unit is indicated by the gray circle. 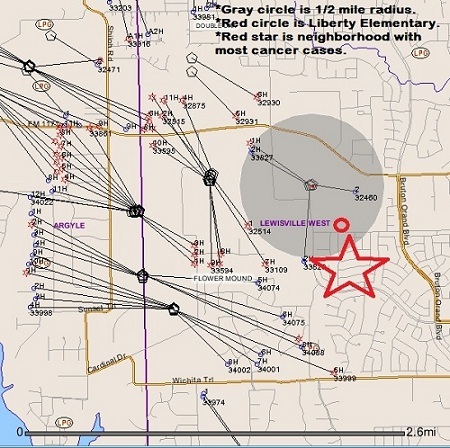 The red circle shows Liberty Elementary. The red star is the neighborhood where most of the cancer victims live. This map and the number of cancer cases in close proximity to drilling and fracking, makes our setbacks look kind of puny. We know that the toxic compounds travel farther than 1/2 mile. In Argyle – Bartonville, the community did baseline testing when drilling was just starting. The results showed 7 detects of the 84 chemicals TCEQ routinely tests for. Follow up testing, on the lot where the high school band practices–1/2 mile from the offending facility–showed 65 detects. We have asked many scientists to explain the increased risks when our children go from breathing 7 chemicals to breathing a cocktail of 65 different chemicals. None can explain that risk because that science has not happened yet. 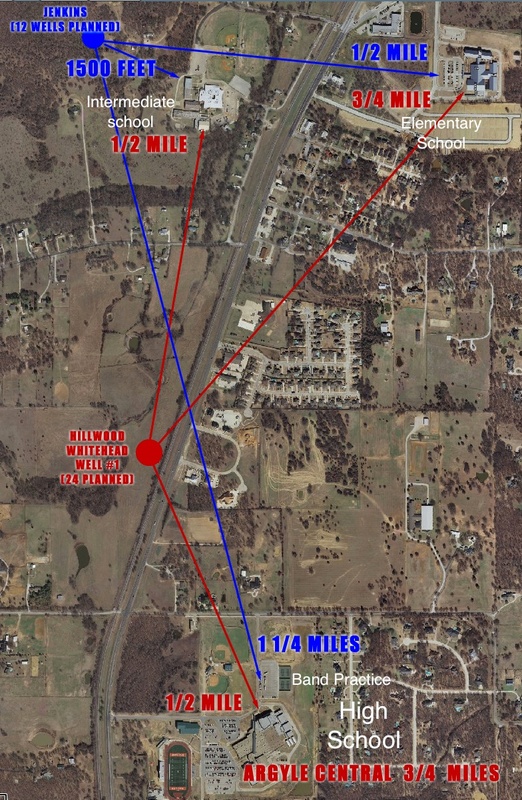 Here is a map showing the Hillwood (Ross Perot Jr’s company) facility 1/2 mile from the high school band practice lot. More information about the Flower Mound cancer rates from the Argyle – Bartonville Communities Alliance. In the fall of 2004 the construction of two wells and a compression station began in Flower Mound. This natural gas drilling facility is known as the Bunn unit, it is approximately 1300 feet or ¼ mile from Liberty Elementary School. When the children can are on the playground, they can see the work-over rig during recess. Six years after commencing construction, in response to citizen concerns about possible elevations of cancer in the area near Liberty, an investigation by the department of state health services was conducted. Yesterday I spoke with two representatives of Flower Mound Shares to confirm two cases of brain tumors, 10 cases of breast cancer and 12 cases of childhood leukemia [NOTE: Lorrie Squibb’s cancer is not included in these statistics.] all within the area of Liberty Elementary. These figures are alarming – especially the childhood leukemia part – because the children in the area were beginning to be diagnosed in 2005 – one year after construction. 20% of the cancer in Denton County comes from this one neighborhood in Flower Mound. Here is a Google Map showing the location of wells in Flower Mound and Lorrie Squibb’s neighborhood. This map is a work in progress. 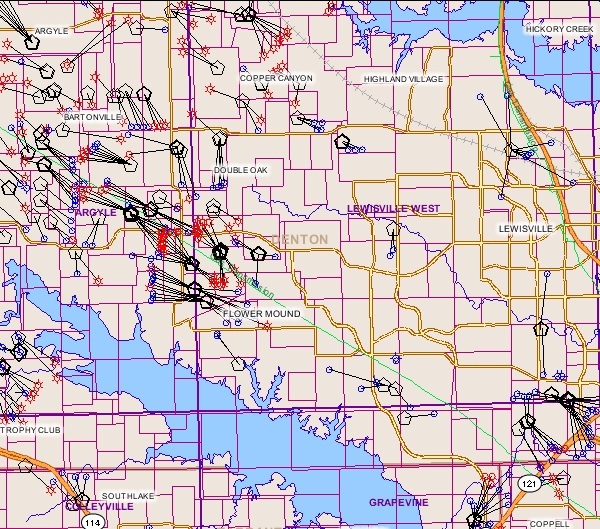 Our Oil and Gas Regulatory Agency ~ The Texas Railroad Commission ~ is so busy permitting all the gas wells and having Rule 37 Hearings that they just can’t get around to the Map DETAILS that would help us understand what the heck is going on. Ya know, why would we need to know the accurate location for the wells from our regulatory agency?? The RRC does ONLY what the industry wants them to do. If you think they will do anything to help the ordinary citizen, THINK AGAIN! 12 cases of childhood leukemia? Not only awful, statistically that is highly significant and points to a common cause, probably environmental. We need a class action suite against the drillers and our regulators and lawmakers. Another “rare” for mid aged white women triple myeloma case is in Arlington. She worked downwind at an elementary school where they fracked 5 wells in January (see youtube “fracking Near Bailey Junior High”) and lives downwind from the Arlington Compressor Station #1. She was diagnosed in July. In May another teacher at theat school 34 years old died from an aneursym. Connect the dots…we are dying slowly but surely. Thank you for sharing the news of the cancer cases in the barnett shale. Totally agree with you on so many things but I wanted to point out that the 12 Leukemia cases aren’t all from Wellington Estates. Thanks Chris. I’m not even sure where Wellington Estates starts and where it stops. I was just working from the information I could gather from others. I don’t think I said they were all from Wellington Estates but maybe it appears that way. Can you tell me how I need to state the leukemia rates so that it’s accurate? That would be very helpful. It’s important to me to get it right. I’m not like industry. If I make a mistake, I admit it. That’s why you will see things crossed out on my blog. I cross out the mistake and insert the correct information. No doubt there is concern for where we live- with Scenic so close and of course, Bunn. I live exactly where Lorrie lived (Wellington Estates by Liberty elementary) and yes, I am a young breast cancer survivor. I saw Bunn flaring and I think there is probably a link. I have all kinds of anecdotal evidence but you know how it is, it’s hard to prove. The Flower Mound leukemia cases are legit but they aren’t all around Liberty. I would say west Flower Mound but not all around where Lorrie lived. Now with the breast cancer cases in west Flower Mound- it makes you pause and wonder. When the state runs the numbers for the breast cancer cluster, it’s important to dissect the rates for women under the age of 40. Young women with breast cancer are in a different class and perhaps this is more indicative of environmental causes. (The health department tried to tell me we have more young women with breast cancer in our zip code because of a possible familial link that would skew the numbers. News flash: we’re not all related.) As for me, I ran around shouting that something was wrong for about a year or so and… well, I’m tired. But I watch and read and interject a little when I think it will help. Keep up the good work! BTW, the little back and forth on Flower Mound Cares was hysterical today. I made my Mom delete the 60 post thread. Poor thing, she’s not used to Flower Mound craziness. But, who is? On the Google Map I put a red cross in the zip code area where Liberty Elementary is and a red cross in the other zip code where some of the cancer cases are. Since none of the cancer cells come with labels that say “From Bunn Unit” or “From Scenic Facility” they call it anecdotal. I’ll tell you what is anecdotal: “we have drilled safely for years.” They have left a huge wake of sick people is what they’ve done. I heard yesterday that there are two new cases of cancer in those areas. I know you’re tired. I don’t blame you. Yeah, that thread today was pretty funny but I did feel bad for your mother. I LOL’d when I read the post from the Weems lady. I’m not going to roll in the mud with mentally ill people but I’m not going to let them call me “shady” either. I’ll overlook a lot but that went too far. It’s good that your mom deleted that mess. I teach in the graduate planning program at UT Austin and I’m doing some research related to fracking on the Barnett Shale. The state’s health study notes that there was considerable growth in Flower Mound during the time period that reflects the breast cancer cluster (suggesting that perhaps the problem was not home grown). As a breast cancer survivor myself, it occured to me that it might be possible (and perhaps not that difficult) to locate and ask those breast cancer survivors (or relatives) if they have lived long in Flower Mound? Perhaps you have a “breast cancer community” loosly linked through support groups, or word of mouth?